Casio Privia PX-870 Digital Piano Review : Privia PX 860 is a fantastic addition to any home, house of worships (church) or anywhere you need an authentic piano experience with a touch of style. The PX 860 has a beautiful and unmatched grand piano sound. The secret behind the wonderful sound of Casio Privia PX 860 is Cassio’s AIR technology that’s Acoustic and Intelligent Resonator sound source. It is capable of producing a piano sound with what we call multi-dimensional morphing it means there is an ultra-smooth transition between soft playing and firm playing so you never hear an awkward transition, its always silky smooth. The PX 860 has some distinct advantages over its little brother PX 760. (The following paragraphs are highly technical explanation and may be it won't make any sense to you. One of the advantage over PX 760 is string resonance. So if you hold down a C major chord just quiet enough so that you can’t hear the key sound but the keys are pressed down. So on an acoustic piano the felts would be raised off the strings. 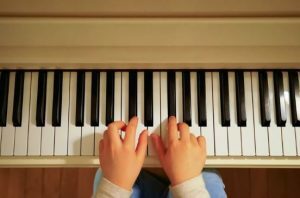 Now when you will press a “C” an octave lower and then you will hear that C major chord resonating because there’s a harmonic relationship between those three notes and the note that you played. Now if you play a note a half step up those strings do not resonate because that harmonic relationship is not present between them. 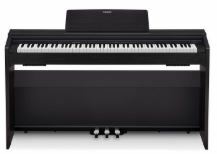 It is just one of the fantastic attention to detailed aspects of the PX 860 that lets you go to the next level with your piano performances. For example composers as Debussy would compose with this technique in mind so now you can play his composition with complete authenticity. 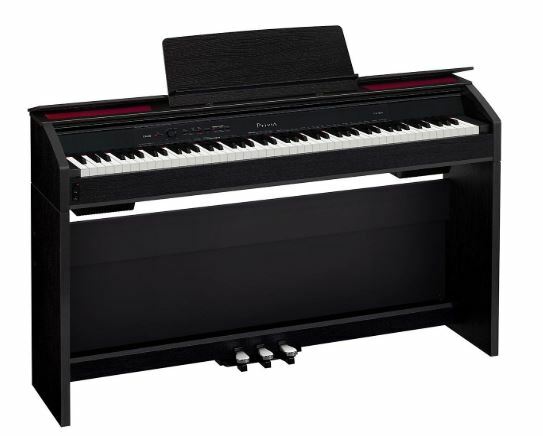 Other great thing that PX 860 offers with regards to piano is damper resonance. So as you play on the upper register with the damper held down you can really hear the swirling area effects of the sound resonating off of the soundboard. The damper resonance is simulated on both the PX 760 and the PX 860. The PX 760 and PX 860 both also has hammer response. On a real acoustic piano there’s slight amount of time between when you press the key and when the hammer hits the strings. So the hammer response simulates that slight delay. You can adjust it so that it either gets completely off or at a very natural amount of time or significantly more delayed. But by default its set just about perfect for a grand piano. 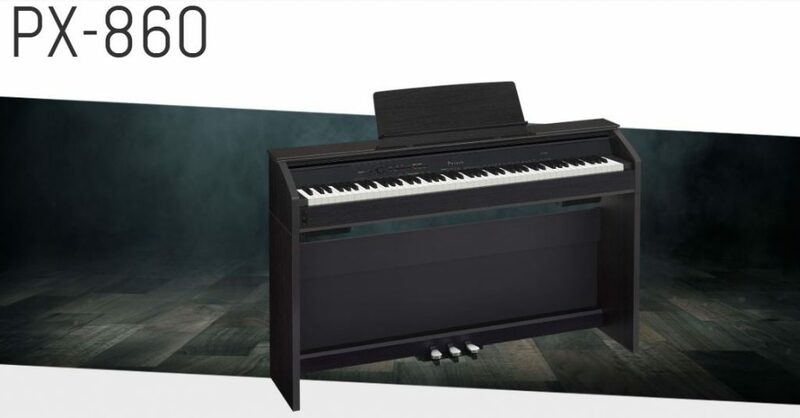 In addition to piano sounds the PX 860 covers a lot of additional ground. Example if you hold down the function and press another any of the keys like electric piano for example you will get 18 sounds and total to choose from. Casio Privia PX 860 makes it’s extremely easy to layer sounds together. 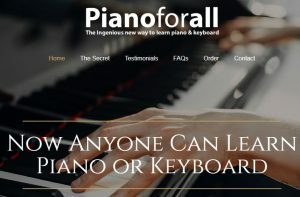 Let’s assume if you wanted to put piano and strings together than all you need to do is hold the function button on top of the board and then press the keys you want to layer together and Boom! it’s done. 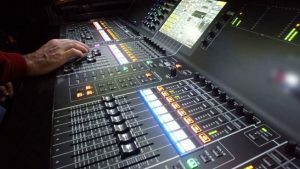 Recording is one of the most required features now a days and is also quite helpful. Once you find some sounds you like it is very easy to record as well. Both the PX 760 and 860 have two channel recorders that you can use to save your creations. The PX 860 goes a step further with an onboard USB port that allows you to record two channels of audio directly to a USB thumb drive. So it’s very convenient to be able to record your audio then upload it to your computer and be able to share it with others. Some other great features to enhance your creativity that Casio Privia PX 860 offers are metronomes. 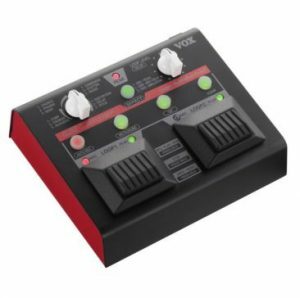 Both the PX 760 and 860 have metronomes which you can turn on and off right from the front panel and you can adjust the amount of beats per measure and the tempo using the function button and the keys on the left side. The most important feature for teachers and students are the duet mode function. 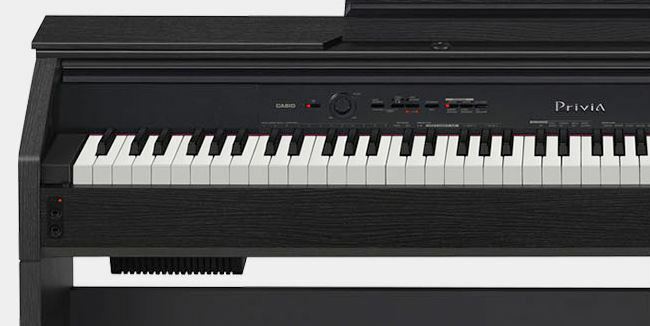 Both PX 760 and 860 features a duet mode. To activate the feature you just need to press and hold the function key and then press duet key. Now your board will be divided and each side will have it’s two middle C’s. Now, so this means that both a teacher and a student or two students can use the same instruments. Casio Privia PX 860 goes a step further with what’s called pan mode. If you turn on pan the left side of the keyboard sound will come out of the left line output and the right side sound will come out of the right line output this feature is tremendous add-on if you are considering purchasing a digital piano for a music education environment where there might be multiple pianos and a teacher in the front of the class. For solo lessons or lessons with a teacher you will be happy to know there are two headphone jacks right on the front panel for quiet practice. Also on the PX 860 you can lift the lid to reveal two speakers up on the top. There are also two speakers on the left and right side here and there are two speakers below. This gives you an entire sound field of an acoustic grand piano. When you play on the left side you will hear the sounds from the left hand strings coming a bit further to the left of the piano vice versa on the right side the higher strings (just as they would be on the real grand piano) will come out of the right side of the piano. Casio PX 860 has try sensor 2 scaled hammer action keys. It feels absolutely fantastic and is weighted just like a grand piano the heavier keys on the bottom and the lighter keys on the top. The keys also have ebony and ivory finish which means not only does it feels like a great vintage piano but it also gives you a confident grip if you are playing in a humid or very hot temperature environment. So you can always feel confident about your playing. 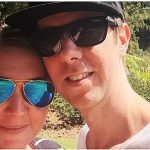 There are a couple other cool features that needs to be mentioned are Concert play. 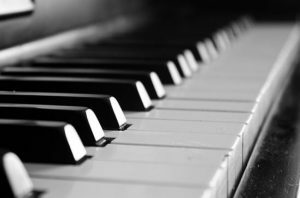 When you turn on Concert play, you will have access to 10 recordings of symphonic orchestra music featuring piano parts. You can either listen to these or you can play them back without the piano. This allows you to practice it on your own. There even a lesson feature to help you to learn. In addition to that Casio Privia PX 860 has another outstanding feature termed as “Hall Simulator”. The Hall simulator makes the sound of the piano like you are playing it in a huge spacious hall. Example when you turn on the Hall Simulator and select suppose French Cathedral (which you can select from the front panel) and then when you play you can hear the reverberation and the acoustic space of a cathedral. This is advantageous not only for creating spacious effects but for composing and practicing too. You can judge your playing dynamics based on how it might sound to an audience member in the huge concert space. Similarly if you are composing you might want to try your composition in different venues to see how it sounds on different environment. Below the bench you will get 3 different pedals, Soft, Sostenuto and sustain pedals on both of the models, this add-on recreate the experience of playing a piano completely. The pedals are completely fixed in the perfect position. When not in use you can cover the keys with in-built sliding key cover to protect it from dust. Both of the models comes with a beautiful wooden cabinet. 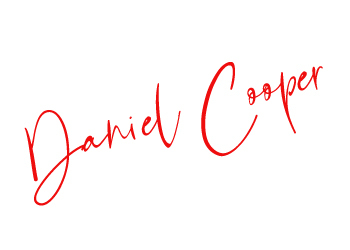 It is very stylish, compact and looks absolutely fabulous. It will definitely increase the beauty of your living room too. So, In short I can say that Casio Privia PX 860 is really a wonderful digital keyboard. 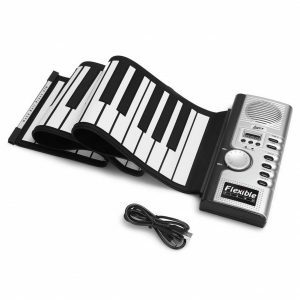 It is loaded with all the basic and advance functionality a pianist wishes for. However the price is bit high but if you are into musical stuff you can very well understand that its quite reasonable. So, that’s all from our end. We Hope this Casio Privia PX 860 review helped you guys to make a better decision.